Kids love filling these 6 inch tubes however don’t be surprised to see many adults filling tubes as it takes them back to their youth of eating *Pixy Stix® and *Lik-M-Aid® Fun Dip®. This product dispenses 180 servings. The common mistake made by all is that this product contains a tremendous amount of Sugar. While Pucker Powder® is basically a dextrose based product, it does not contain as much sugar than one thinks. A 6” tube contains only 9.7 grams of sugar and carbs. When you compare this to standard size candy bars and other candy products this is typically 1/3 the amount of sugar and when comparing to many sports enhancement drinks it is typically 1/6 the amount of sugar. 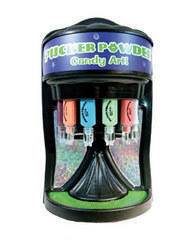 Pucker Powder® Is Kosher - mostly Currently all Pucker Powder® flavors with the exception of Grape, Strawberry, and Watermelon are Kosher. Let us know if your event requires Kosher only products. This is often used for Bar/Bat Mitzvah and Sweet Sixteen Parties. Provides 180 servings for $199.00 or $180 when rented as part of any package. Refills are sold per 30 servings for $30.00. Straws are 6" which children prefer so they can get more than one 'turn' to make the artistic tubes.